What Is iPhone 4's FaceTime Video Chat? Steve Jobs usually saves the meatiest bit of his keynotes for the end. 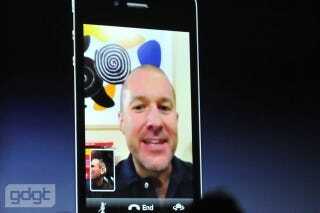 But WWDC's "One More Thing" was a little tame: FaceTime, a video chat system for iPhone 4. So, what's special about FaceTime, and how does it work? For now! Though Jobs says they're working with carriers to get networks up to speed to support cellular video calling later. [FaceTime is] Based on many open standards, h.264, AAC, SIP, STUN, TURN, ICE, RTP, SRTP, Apple going to standards body tomorrow to make FaceTime an open industry standard. SIP? I guess Apple just build their own little VoIP network, sort of! ...but it's only available for the iPhone 4 at launch. People may groan a bit at what seems like a smallish technological step, but this lays a lot of groundwork. First, it means that within a few years, the one of the most popular handsets in the world will support video calling, which is still relative rare. It also means that Apple competitors will likely speed up their development on competing techs. It also means that Apple could potentially expand video chat to all kinds of platforms , that we could see it in Mac OS and elsewhere, and even on Android. It's effectively an open VoIP network, meaning that all-purpose chat clients, like iChat, could easily integrate it in the future, assuming Apple opens development for non-mobile software. Then again, that's just Apple's hope—they don't yet own video chat, so FaceTime could just as easily become as marginal tech as a dominant one. Thanks to GDGT for the photo, and fantastic liveblog, and MacRumors for their coverage. For more on iPhone 4, here's our complete coverage.